Telenor Is One Of The Best & Biggest Telecom Network In Pakistan That Provides Low Rated Call Packeges, Internet Bundles & Sms Offers & Bundles. Telenor Is Popular Amung People Due To Their Cheap Rated Packages & Quality Network In Pakistan. Telenor Paksitan Introduces Time By Time Latest Offers For Their Customers, Now This Time Telenor Pakistan Brings a New 3G Internet Offer For Their Customers. 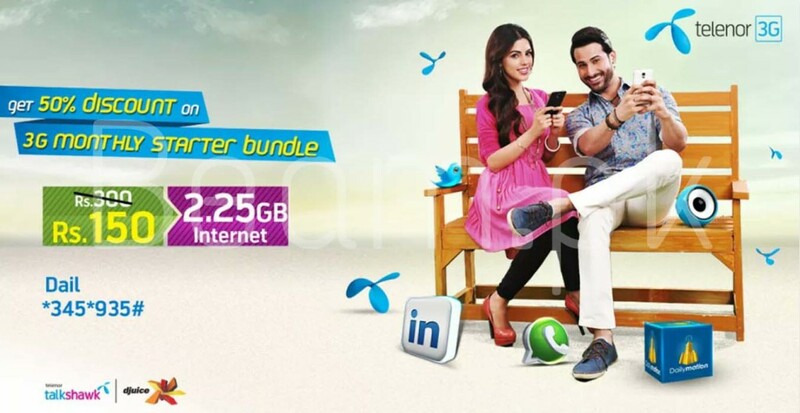 Offer Is Named By “Telenor 3G Starter Bundle” That Will Give You 2GB 3G Internet In Just Rs. 150 For The Whole Month. You Can Use That 2G Internet To Browse Something, Can Use Facebook, Whatsapp, Youtube, Also Can Download Videos & Much More. You Can Check Details Of This Offer Here Below. Just dial *345*935# form your Telenor Number To Get This Offer. You Can Get This Great Offer In Just Rs. 150 (including taxes). You Will Get 2,250 MBs of Telenor 3G Internet Data. Telenor 3G starter bundle is Valid For 30 days. Prices are inclusive of applicable taxes.